MILES G C BOND, was born January 14, 1849, and died January 14, 1903. Buried in Bond-Redmond Cemetery Harrison County. MS. He married MARTHA JOHNSON. She was born December 18, 1857, and died August 09, 1940. Buried in Bond-Redmond Cem. Harrison Co. MS.
i. JOHANNA R. BOND, b. 1875; d. 1878.
ii. THOMAS R. BOND, b. June 17, 1876; d. January 15, 1953, Bur in Bond-Redmond Cem. Harrison Co. MS.
iii. DANIEL R. BOND, b. 1877.
iv. DORA J. BOND, b. 1880.
v. MARY E. BOND, b. 1884.
vi. MILLS T. BOND, b. 1886. 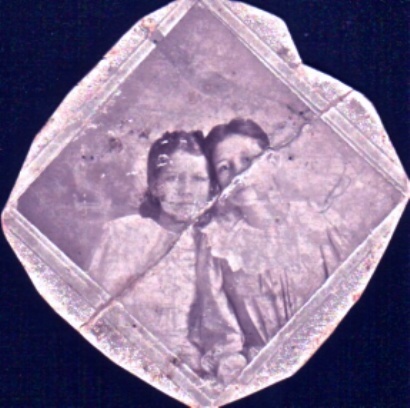 R-L Dora Bond, Mary E Bond, daughters of Miles G C Bond. DORA JEAN BOND. born, Oct 6 1880, married JESSIE WIGGINS LOTT, son of Jessie and Dicey ( Wiggins ) Lott. MARY E ( Polly ) BOND. born 1884, married ARTHUR LOTT, born, Mar 9 1884, son of Frank and Mary ( Hickman ) Lott.